Can sound help us detect 'earthquakes' on Venus? Detecting an "earthquake" on Venus would seem to be an impossible task. The planet's surface is a hostile zone of crushing pressure and scorching temperatures—about 874 degrees F, hot enough to melt lead—that would destroy any of the normal instruments used to gauge seismic activity. But conditions in Venus' atmosphere are much more hospitable, and it is here that researchers hope to deploy an array of balloons or satellites that could detect Venusian seismic activity—using sound. These kinds of low frequency or infrasonic sound waves, much lower than an audible voice, are already measured on Earth. The rumbling or "hum" can be generated by sources as diverse as volcanoes, earthquakes, ocean storms and meteor air blasts. In recent years, says Los Alamos National Laboratory researcher Stephen Arrowsmith, infrasonic observations have undergone a renaissance of sorts, especially as a relatively inexpensive way to monitor atmospheric nuclear weapons tests. But last year, a team of experts convened by the Keck Institute for Space Studies began thinking of ways to use infrasonic observations to get a better look at the geological dynamics of Venus. At about 50-60 kilometers above Venus' surface, the temperature and pressure conditions are much more like those on Earth, albeit with a denser atmosphere. This dense atmosphere helps translate any seismic waves into infrasonic waves that can be detected with instruments floating above the planet's surface, says Jim Cutts, a Jet Propulsion Laboratory researcher who participated in the Keck conference. Infrasonic waves can be "felt" as either fluctuations in pressure, or as light emissions called airglow, or electron disruptions in Venus' upper atmosphere. 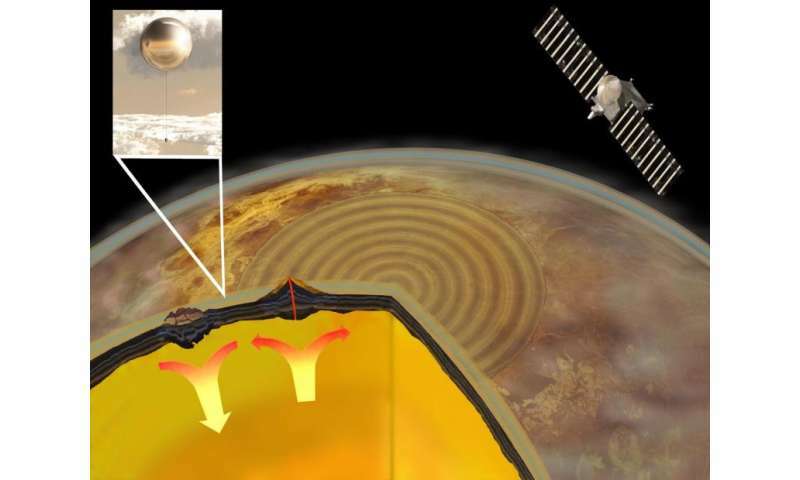 Arrowsmith and colleagues say that barometric pressure changes might be detected with a series of balloons in the Venus cloud layer at 55 kilometers above the surface, such as those launched by the Soviet Union in Venus' atmosphere in the 1980s. In a second talk, Philippe Lognonné and colleagues discuss a complementary way to analyze the planet's infrasonic waves, using orbiting satellites to detect airglow. In both cases, the first goal will be determine what the noise-to-signal ratio might be for these two techniques. The researchers want to know if the instruments onboard a balloon or satellite will be sensitive enough to detect and identify a seismic signal in the midst of other infrasonic waves, and how large of a seismic event might be detected by these observations. If these techniques can help scientists get a better sense of seismic activity on the planet, it could tell them more about the history and current state of Venus' interior, the researchers say. Venus' inner evolution would be especially interesting to compare with Earth's, to discover more about the diversity of planet formation and why certain features—such as tectonic plates and a dynamo mechanism in the core—exist on Earth but not on Venus. James Cutts, Stephen Arrowsmith and Philippe Lognonné will present their findings on April 23 at the annual meeting of the Seismological Society of America. Why does Venus' atmosphere rotate sixty times faster than its surface?